The Selene videogame was the subject of a poster presentation June 10 at the Games, Learning, and Society Conference in Madison, WI. 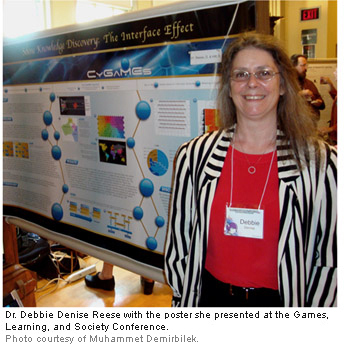 Dr. Debbie Denise Reese, senior educational researcher at the Center for Educational Technologies® and principal investigator on the CyGaMEs project, presented "Selene Knowledge Discovery: The Interface Effect." The CyGaMEs project is funded by the National Science Foundation to carry out research into videogame learning, design, and assessment that first began with the NASA-funded Selene project. Selene is the videogame at the heart of the study. Dr. Ben Hitt, director of the Schenck Center for Informatics Science at Wheeling Jesuit University, was a coauthor of the poster. The session discussed Selene research that found gameplay data support the efficacy of the Selene game interface as currently designed. Advance knowledge discovery analyses demonstrate that the Selene accretion game interface successfully guides player progress toward game and analogous learning goals. No clear relationship between player demographics and gameplay emerged. In other words, players' performance and flow reports (a measure of player engagement) were independent of player demographics. Player characteristics such as gender, parent level of education, and grade point average do not constrain player success. These results are important because they guide game redesign efforts and demonstrate that instructional games can enhance achievement for youth with less privileged backgrounds.